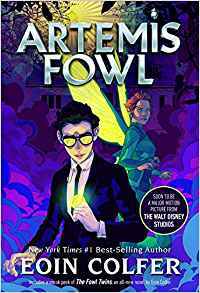 This is the first book in the Artemis Fowl series. Before I do anything I would like to give you a short summary of the book so that you’ll understand what I’ll talk about later. The main character is a twelve year old boy named Artemis who is a criminal mastermind and a genius. In the course of one of his schemes, he manages to find the People or the fairy folk. The People have been living underground for a long time hidden from the Mud Men or humans. They have survived this long thanks to Foaly, the centaur also a technological genius. Artemis manages to decipher the Book (the rulebook of the fairies) which is written in Gnommish. This is a first. He learns that fairies need to complete a Ritual so that they can restore and replenish their magic. The Ritual involves plucking an acorn from an ancient tree and while the acorn is still fresh, planting it on a full moon night. Artemis goes to all the ancient oak trees onn full moon nights in the hope of catching a fairy. After many long waits he is rewarded. He captures Captain Holly Short of the LEP (fairy police force) He holds her captive and asks for a ransom from the LEP. The LEP has no other choice but to put a time field on Artemis’s house. A time field stops time in that particular place for at least 8 hours. If Artemis did not give up Holly by the end of the eight hours the LEP would have too release a bio-bomb that kills all living creatures and leaves everything else untouched. Is Artemis as clever as he seems? Will he be able to win without getting killed? This was the summary. If you didn’t understand parts of it don’t worry. It is slightly confusing when you first read it. The book has very elaborate descriptions of everything including Haven (the city of the fairies). This along with all the technology created by the People makes th book very confusing. To be honest, I did not understand the series the first time I read it, so I had to read it a second time. When you understand the series, you love it. The plot of this book was very good and had many sarcastic and humorous parts in it. One of my favourite characters is Mulch Diggums. He is described so well, and he is the one that brings all of the fun into the book. I haven’t mentioned him in my summary, but he is an important character too. Artemis is very ingenious, and you are surprised by all the plots and schemes he can come up with. Commander Julius Root is the head of the LEP forces and is also one of my favourite characters. The way he always explodes and shouts makes him hilarious. There is a lot more in this book. Read it and I guarantee you won’t get bored.